IF YOU LOVE GOD, SEND THIS TO EVERYONE YOU KNOW!!!!!!! But we believe that through the grace of the Lord Jesus Christ we shall be saved, even as they. You have no doubt seen posts like the title of this around social media. There may have been variations, such as saying Jesus, or saying that you will be blessed if you share this in the next ten seconds. A few even say that you will be saved if you share it. I’m doing this post for personal reasons. Considered doing it awhile back, but decided against it because I thought of it as a “nonissue”. But I’ve been having someone bombard me with these messages multiple times a day for months. I have asked her to stop countless times, but she ignores me and keeps on doing it. This turned into an argument with me showing her other non-religious things she’d sent, including fake amber alerts and those annoying “send this panda/flower/etc to everyone you know to show you love them” messages. She then resorted to personal attacks, then blocked me. I say all of this because I felt like it’s apparently important to point out that Jesus did not call us to like posts and type “amen” to be saved. To be saved, you must believe in Jesus. But not just believe in him. Thou believest that there is one God; thou doest well: the devils also believe, and tremble. So it’s not enough to just believe in Jesus. Even the devils believe in Him. They know He exists. No You must also believe Jesus. Trust in Him. Being obnoxious about it just turns nonbelievers away. 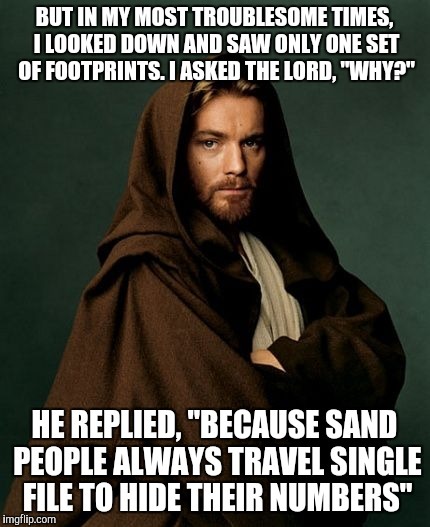 Also, for those who are quick to share anything that says “Share if you love Jesus” without really looking at it; The power of Obi-Wan compels you! 8 But though we, or an angel from heaven, preach any other gospel unto you than that which we have preached unto you, let him be accursed. 9 As we said before, so say I now again, if any man preach any other gospel unto you than that ye have received, let him be accursed. Joel Osteen is the leader of the biggest church in America. 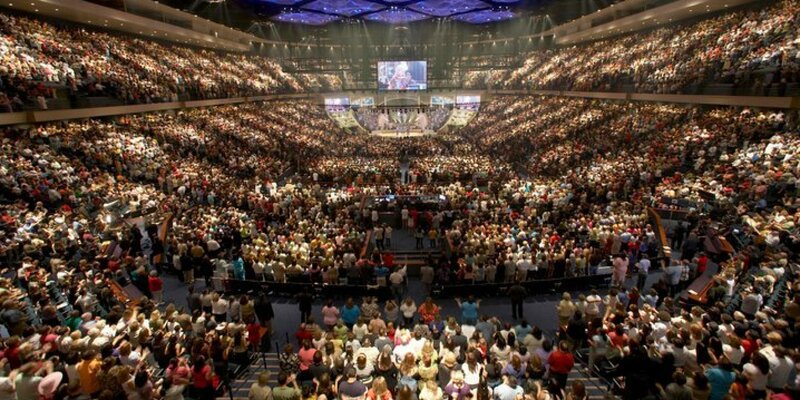 Lakewood Church in Houston, Texas, has over 43,000 members. When I see the above picture, I find it mind-blowing. How can so many people be brainwashed by this guy? If they read their Bible, they’d know that Joel Osteen was a wolf-like sheep. Why do I call him that? Because he’s not a pastor, he’s a motivational speaker. Joel doesn’t use Jesus’ name, doesn’t talk about being saved by the Blood, doesn’t even talk about going to hell for not believing. So what does he talk about, and why are so many people flocking to him? These are just a few of his quotes. They don’t even sound scriptural. But they sure do sound good, and if you didn’t know your Bible, that’s the sort of nonsense you’d want to hear. That’s why so many people attend his church, he makes them feel good about themselves. What he’s doing is called “New Age“, and not only isn’t biblical, it strongly goes AGAINST the Bible. Do not be fooled by this wolf-like sheep! “The Apostle Paul Was A Deceiver!” is what made me want to do this series. It’s so easy to disprove that I was actually laughing while scrolling down the page. It was written by Sherry Shriner. If you read the context, Jesus is angering the priests for performing miracles on the Sabbath. But she said Jesus says that you have to be circumcised. Let’s go read what Jesus said on the matter, using only the verse she gave. Oh, well there it is. He totally said……nothing, because He was a baby. He had it happen Him. That’s not Him commanding us to be circumcised. Jesus was a Jew, and it was their custom to circumcise. He was also crucified. Does that mean He told us to go be crucified? You can’t even take that verse out of context. She says twice in the same line that “Jesus said it”, but it clearly says He was circumcised. But you need to look at the bigger context. Which she never bothered to do. 15 For though ye have ten thousand instructers in Christ, yet have ye not many fathers: for in Christ Jesus I have begotten you through the gospel. 14 I write not these things to shame you, but as my beloved sons I warn you. Why, that looks like he’s speaking metaphorically. The next thing she does is take three verses out of context, literally splicing them together to make a new sentence. 24 But none of these things move me, neither count I my life dear unto myself, so that I might finish my course with joy, and the ministry, which I have received of the Lord Jesus, to testify the gospel of the grace of God. 23 All things are lawful for me, but all things are not expedient: all things are lawful for me, but all things edify not. For that last one, you need, again, context. After that point, the rest of the page is just a random collection of spliced verses (like “SAUL who is ALSO called ‘PAUL’.” Acts 13:9), and SCREEN-FILLING LARGE FONT LETTERS. The line “THE COMING OF “THE END…THE ABOMINATION WHICH MAKES DESOLATE ” **PROPHESIED BY DANIEL**” Took up my whole screen. From what I could make out, she was trying to prove that Paul was the antichrist because the antichrist will desecrate the Temple in Jerusalem, and the temple is gone now (even though she even points out that this will happen in the last days). On her list of “truths”, she pointed out, “Paul was never recognized as an apostle by the Disciples OR Jesus”. That is simply not true. Jesus appeared to Paul (then called Saul), and told him to go into the city to be given instructions, and Paul was called to be God’s vessel. 15 But the Lord said unto him, Go thy way: for he is a chosen vessel unto me, to bear my name before the Gentiles, and kings, and the children of Israel: 16 For I will shew him how great things he must suffer for my name’s sake. But she could just say that of course Paul would say that. But here’s the thing, Paul didn’t write that. Acts was written by Luke, who wrote The Gospel of Luke (surprise!). Acts is actually a direct sequel to Luke. If you’re going to say that the Book of Acts is unreliable, then you’re saying the Gospel of Luke is unreliable. 15 Beware of false prophets, which come to you in sheep’s clothing, but inwardly they are ravening wolves. In all my research of the posts for Fig Tree Reborn, I’m always coming across sites, usually other blogs, that teach something other than what the Bible teaches. Often it’s either atheists trying to disprove the Bible or turn people away from it, or Muslims trying to show that Jehovah and Allah are one and the same (they aren’t). Every time I come upon one of those sites, I always check out their claims in the Bible to make sure not only if it really says that, but also to check the context. That’s taking so much time that I thought that I would just make a separate series where I take a site or blog or article and disprove it’s claims. I finally decided that just now, when I came across a site trying to claim that Paul was a false prophet. Their claims were hilariously out of context, and in at least one instance (that I found), they merely used the NIV translation to backup their claim. So without further ado, let’s begin exposing these wolves in sheep’s clothing.